These silky sensations can add a breath of fresh air for your guests at your wedding shower, on the big day itself and/or at the reception! 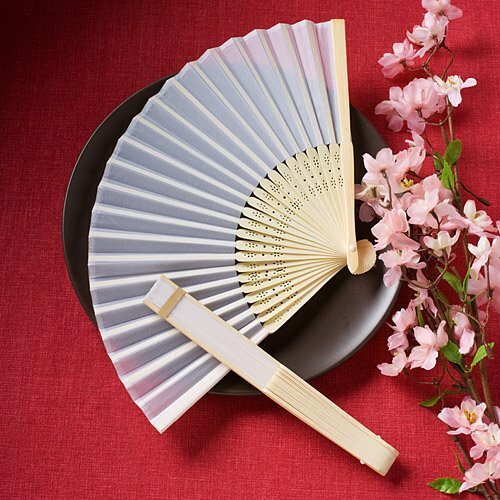 Featuring a collapsible/expandable construction that opens to reveal delicate white silk, our 8-1/4" silk hand fans are attached to a sturdy light colored wooden frame of bamboo. The frame also includes an intricate cutout design and the fans arrive packaged in a white gift box. This is a White Folding Silk Hand Fan by Fashioncraft. It is a perfect wedding favor made of high quality material, as you can see, with intricate design on the bottom. And because it's white, it is a nice compliment to any color-themed wedding for summertime to shade the sun, or to fan yourself when it's hot. Perfect wedding favor for your guests. We only have them in this one hand-held size available on our site. Hi can u personalize the favors?